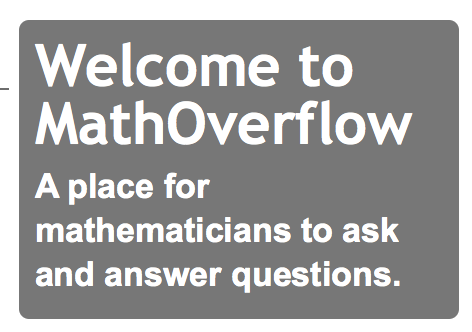 I assumed the name of our site “MathOverflow” is derived from the name “Stack Overflow” of the first and largest site that used the same base software (Stack Exchange). Is this so? If it is, then what is the historical reason why “MathOverflow” does not have a space before the “Overflow” part when “Stack Overflow” does? There are lots of reasons I think "MathOverflow" is an excellent name. Of course, I'm somewhat biased. It pays tribute to Stack Overflow, which I think is important because in addition to running the software developed for SO, MO runs basically the same philosophy as SO. 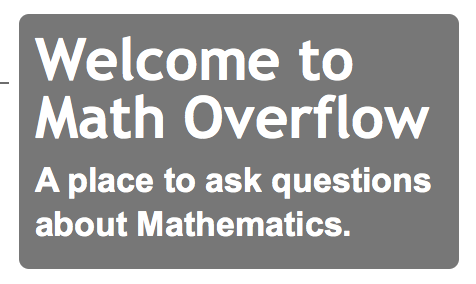 If you do know about Stack Overflow, "MathOverflow" is the canonical name. When I had put up a beta sign-up sheet for MO, but wasn't advertising at all, a lot of the sign-ups came from an SO comment thread where somebody had independently invented the name "mathoverflow" and somebody pointed out that such a domain was actually registered and such a site was actually going to exist. While indeed (as Dmitri Pavlov points out) the first 2009 design of the site said "Math Overflow" with a space, as one would expect from a Stack Overflow analogue, this comment by Anton suggests that he thought of the site without a space from the very beginning, and in 2010 the design caught up.